Going palm oil free | Is it possible to completely avoid palm oil? Sometimes you just fancy something, you want it, you deserve it, and you know it will hit the spot. A guilty pleasure. Yesterday, I ran a half marathon. Sometimes runs go well, and sometimes badly. But when they go well, endorphins kick in, you feel rightly proud of yourself, and on that “high”, you want to treat yourself. My Garmin (a GPS gadget worn on my wrist) told me I burned off 1900 calories. I beat my personal best by 15 minutes (though when you’re as slow as me in the first place that explains how it would be possible). I felt good. I headed for the ice-cream van. There it was, just what I wanted. Cool, refreshing and memories of childhood. A “99” icecream with Flake. For those who don’t know what a 99 is – here it is immortalised by the Royal Mail on a British stamp. Just as I approached the back of the short queue, I remembered. Processed whippy ice-cream, it’s probably got palm oil in. Come to think of it, so has the cornet. Oh, and even the Flake, which is Cadbury’s milk chocolate. Disappointed, my nose smelt another mouthwatering smell – that of bacon wafting over from another stall. Bacon cobs/rolls/butties, call them what you will – manna from heaven. Somewhat deflated, I headed back to the car for a Nature Valley cereal bar. I love these things and they are palm oil free. But somehow, as third choice, this one didn’t seem so good. “Oh, I don’t know, let me have a look”. The assistant left the shop front, but clearly in view stared at a large vat of oil, before returning with a smile. 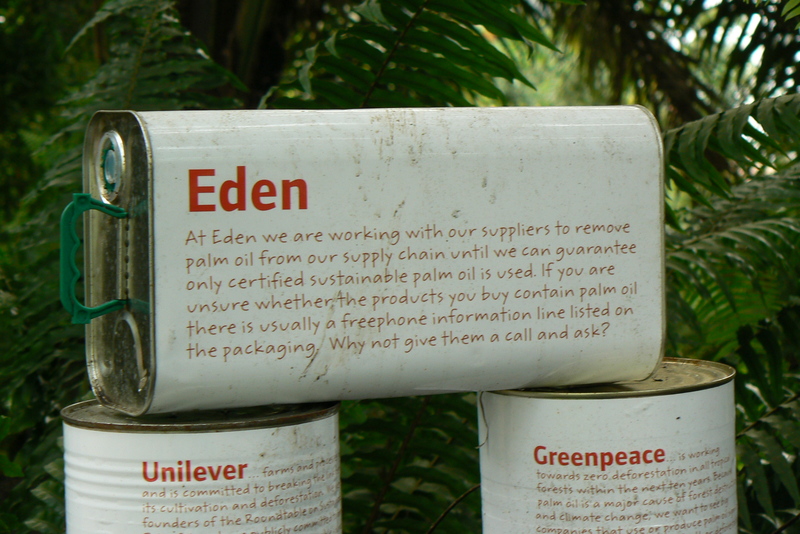 “No … it’s palm oil”. It’s hard work being virtuous and sticking to a principle. Today at work there were Krispy Kreme doughnuts for all to share and every day offers temptations. I can’t complain – I have all-butter palm oil free shortbread staring me in the face now as I blog. Options are limited and spontaneous ones even more so. But if one more person asks why I, of all people, am turning down doughnuts and ice cream to nibble on cereal bars and home made flapjacks, then the word is spread a little further and it’s worth it. It seems that a palm oil free diet is not too bad if you can be selfish. Cook all your meals and bake all your bread fresh at home. Turn down anything you’re offered (and it’s always the nice stuff – cakes, biscuits, chocolate …) and only eat what you have vetted, or what you have asked someone to cook for you. It’s depressing, but doable. This is a late post, but it concerns Mothers’ Day ten days ago. Short of asking my mother to feast on a bargain bucket at palm-oil free KFC, how can a grateful son be selfish and avoid a meal out on Mothers’ Day? A few days ahead of the day, I decided to visit the ASK restaurant (Mums eat free, I might be a kind son but I know a good deal …) and e-mailed ahead to find out their palm oil policy. The Sunday came and went, and I had to just eat and hope. On to better news and a plug for somewhere I have never been but would love to visit. My parents have recently returned from Cornwall and the Eden Project. Apparently there was not a biscuit to be found – the staff muttered something about palm oil and the fact that they couldn’t guarantee any biscuits would be palm oil free so none were served! Great work, Eden Project, and great work Lone Droscher Nielsen of BOS Global who had given a powerful presentation on her work with orangutans earlier in the year. 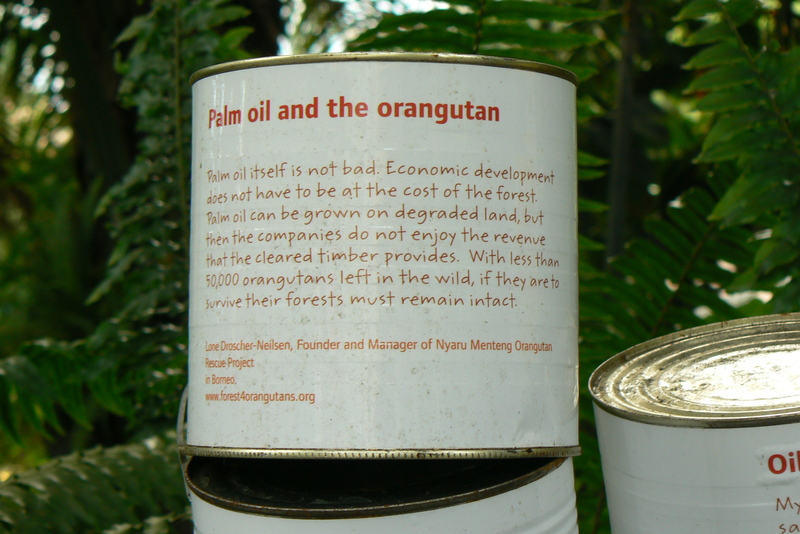 Backing up their stance on palm oil were these photos. Day 16 – a transgression? It was Tuesday – feeling virtuous, I put the breadmaker on for my palm oil free fresh “homemade” bread, went for a run, and came back to tuck into my bread with peanut butter. 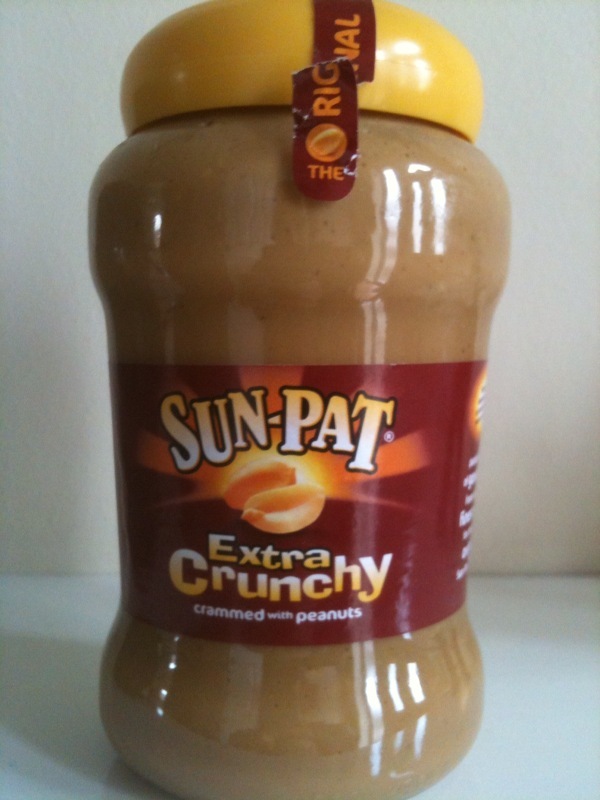 Until now I’ve extolled the virtues of SunPat peanut butter, the only main brand in the shops clearly labelled with no palm oil. I noticed that the labelling looked different. In the 30+ years I’ve been eating it, it’s only ever been “crunchy”. Now it’s “Extra crunchy”. The ingredients had an extra couple of items this time … including “hydrogenated vegetable oil”. I would never be buying this and eating this in Lent with only that information, especially knowing so many other brands that label it more clearly include palm oil as an ingredient. So it’s quite possible that I have been consuming palm oil. It’s one thing checking out food and labels from the supermarket and maintaining palm oil free food at home. But on Saturday I was out for the day. Suddenly snacks and lunches become very difficult. For snacks, almost all crisps, chocolate, cakes, cereal bars or biscuits from the supermarket will contain palm oil. And for lunch, any bread, rolls, ciabattas and panini are likely to have been produced away from the location and contain palm oil. So, in my day out in Hay-on-Wye, research ahead was needed. Lunch was safe – a baked potato, but I always knew that my favourite coffee shop – Shepherd’s, in central Hay-on-Wye, needed checking out. A quick e-mail confirmed that their signature ice-cream, made from sheep’s milk, contains no palm oil. 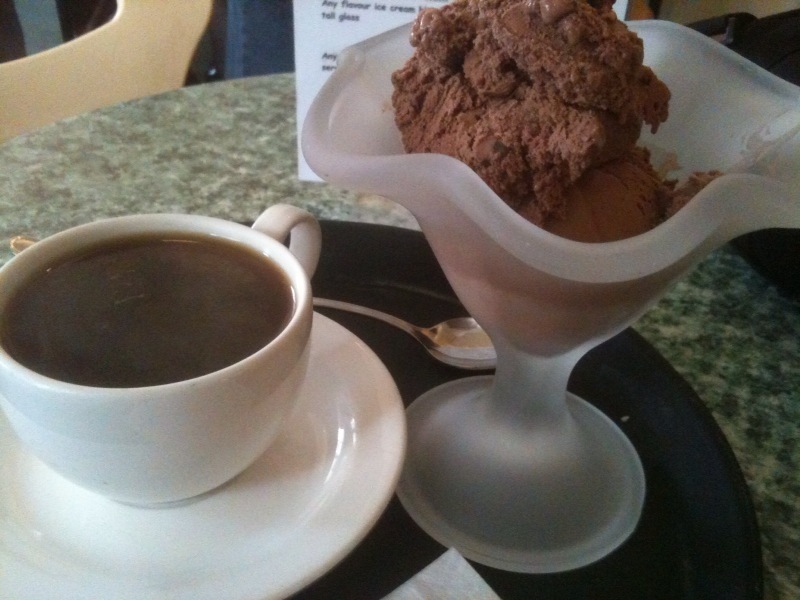 And for getting back to me so quickly and helpfully, I promised http://www.shepherdsicecream.co.uk/ ice cream and coffee shop both my custom and a plug. Both now duly done! Today was a long and busy day. Up at 6:15 and in the office early, I was going to put my palm oil free destiny in the hands of either Sainsbury’s or the staff restaurant. As the morning drew on, it was clear my lunchbreak would only be 20 minutes, and so I went to the staff restaurant. Unfortunately the baked potatoes, the salad and the pasta had all gone, with just a few sandwiches left and some cold curly fries. I know the bread was processed, and my chance for a palm oil free lunch had gone. 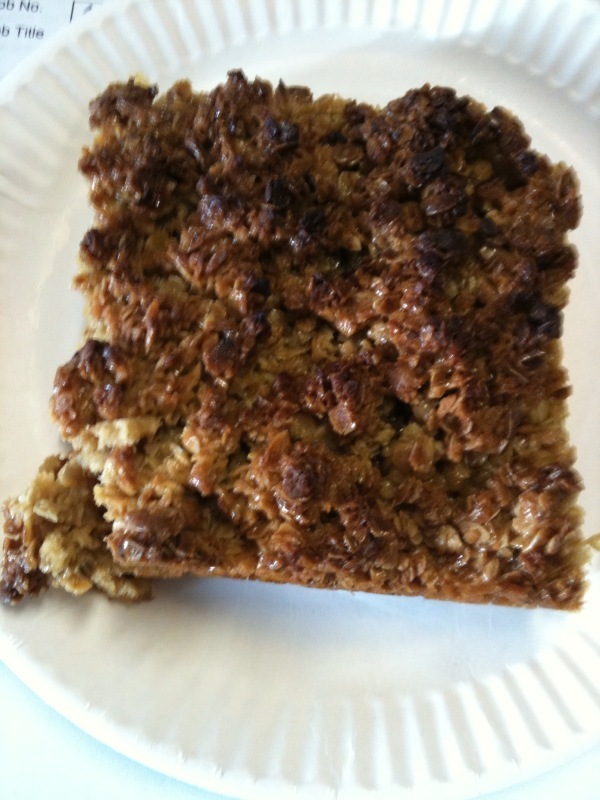 Well not quite – I settled on the largest available piece of home-baked flapjack and a packet of baked Walkers Crisps. Don’t do as I do and skip or skimp on lunch – anyone can go palm oil free if they don’t eat! But this will be a one-off for me. Anyone who knows me knows I don’t do missing meals! The motto is to be prepared, next time I’ll be sure to prepare my own lunch, or take my lunch longer and earlier if at all possible. Fear not, I’ve made up for it with second helpings of home made Thai chicken and cashew nut curry this evening! Well, it didn’t take much googling today to realise that palm oil is commonly used to fry food in a large number of English chip shops. In Scotland, it seems that lard is usually used, but in England it’s likely, though not certain, to be palm oil. The safest thing, were I desperate, would be to approach the shop itself and ask. But is there any guarantee that the employee would actually know? And how suspicious would I seem if I quizzed an establishment on their ingredients and even asked to be taken into the kitchen to see for myself? Still – an alternative is at hand. It’s not exactly the same thing, but this lunchtime, after deciding that the takeaway would not be a viable option for tonight, I looked in vain hope at a bag of Sainsbury’s “Be Good to Yourself” Oven Chips in the freezer, expecting to find palm oil prominent in the ingredients. However, there were only two ingredients: potatoes and sunflower oil. Having now looked at other brands at random, it seems that some other brands have the same ingredients (e.g. McCain’s, other lines of Sainsbury’s) but not all (Aunt Bessie’s is ambiguous). So if you want a different line or a different brand, check the labels! Tonight, in fact right now, I shall feast on sausages and chips! Has a website or blog post ever been entitled “Flapjack and Panorama” before? If you have missed it or would like to know more, please consider the BBC iPlayer. Back to today – a day in the office left me with the mid-morning snack dilemma. With so many cereal bars, crisps and chocolates swimming in palm oil, once again I was drawn towards the flapjack. Chances are, if I were buying a flapjack packaged from a shop, it would contain palm oil too. However, even I know that it’s a relatively simple (if not healthy!) thing to make. And delicious too!